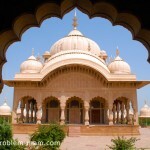 Govardhan is a sacred hill 26km from Mathura. 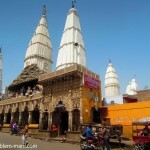 It is an important place of pilgrimage for Hindus; to them, Lord Krishna and Govardhan hill are one. According to legend, in ancient times the villagers feared the wrath of Indra the rain god, and used to perform a fire ritual or yagna in his honour. Indra’s vanity got so bloated by this worship that he came to think he was above the Hindu trinity of Vishnu, Shiva and Brahma. 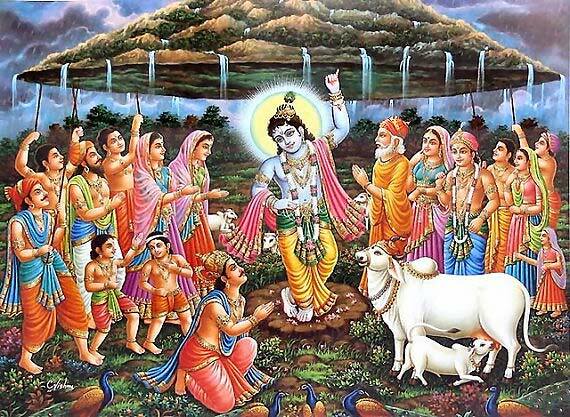 To teach him a lesson, Krishna persuaded the villagers to stop praying to Indra and to pray to Govardhan hill instead. Indra was furious and poured a deluge of rain onto the village. Krishna saved the day by lifting up Govardhan on one finger and holding it over the village like an umbrella for seven days. Indra realised he was powerless and stopped the rain. Ever since, Krishna has asked the local population to worship the hill with pujas and a Parikrama, a pilgrimage around the foot of the hill. The Parikrama: pilgrims perform a 38km circumambulation or Parikrama around Govardhan hill in honour of Krishna. Some pilgrims go all the way round in one day while others perform Dandavata, prostrating full length on the ground as they go. This can take weeks or even months. 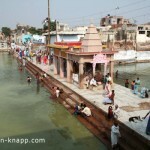 The Parikrama starts at the Radha-Kund bathing tank after a darshan (beholding) of Harideva temple, and ends at the Manasi Ganga Kund bathing tank. 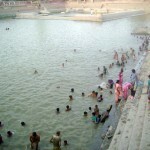 Shyama Kund and Radha Kund are very holy bathing places for Hindus. It is here that the Parikrama begins. The story goes that when the people of Vrindavan heard that Krishna had killed the terrible demon Aristasura, who had appeared in the form of a bull, they rushed to the place in great jubilation. 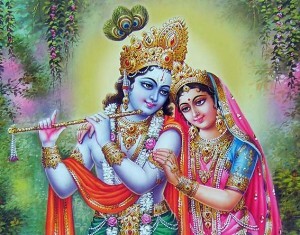 But Radha was angry with Krishna for killing a sacred animal. She told him to purify himself by bathing in all the holy places in the universe; only then would she take him back. Krishna acquiesced but rather than take the trouble to go round all the holy places in the universe, Krishna brought them all to where he was. He dug his heels into the ground making a huge hole, the Shyama Kund, and invited all the holy places to pour their waters into it. Krishna was very proud of this and became arrogant. 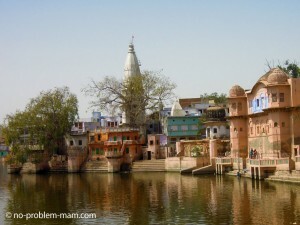 Radha dug out a hole of her own, the Radha Kund, with her bracelets and the help of her gopis. Krishna was amazed and offered to pour water from his tank into hers. 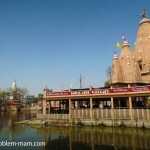 She refused and said that she and her friends would go themselves to fetch holy water from the Ganges in pots. 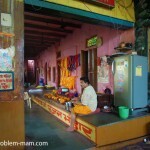 The holy places heard this and begged Radha to let them fill her tank. She agreed. 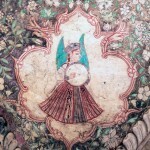 Krishna immediately took a bath in the Radha-Kund and said that all who bathed there with faith would feel the same ecstatic love for him as Radha did. In return, Radha bathed in the Shyama-Kund and said that all who bathed there would feel the same ecstatic love for her as Krishna did. 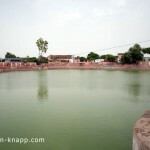 Another important place for Hindus is the very special Manasi Ganga Kund in the centre of Govardhan town. 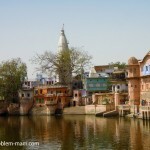 Manasa means “spirit” or “mind” and Ganga is the Ganges: so the spirit of the Ganges inhabits the place. 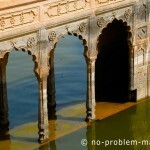 According to the legend, it is the holy water of the Ganges that flows in this tank. 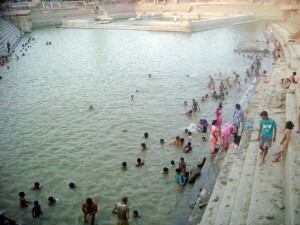 It is said that to bathe in this water brings Krishna Prema, love for Krishna. It is here that the Parikrama pilgrimage ends. 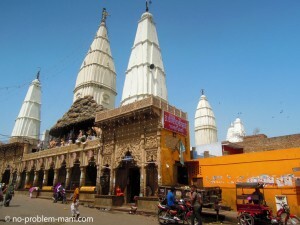 On its bank stands Giriraj temple. With its richly decorated facade showing Krishna lifting up Govardhan hill, Daan Ghati is one of Govardhan’s two most important temples, the other being Sri Giriraj. 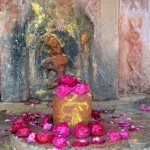 In this temple the god is in the form of a rock that sinks a little further in to the ground each year. A very special temple, without equivalent anywhere else. 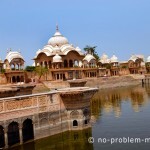 Kusum Sarovar is a big (450m2 ) kund or bathing tank that is said to have been built in the time of Krishna. Kusuma means “flower”. 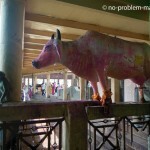 It is said that this place was the garden where the gopis (girl cow-herds) gathered flowers for Krishna. 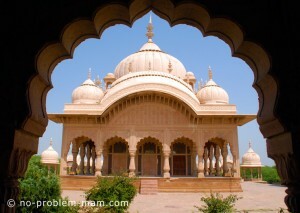 It was the king Jawahir Singh who gave the tank its current form and its Rajput style pavilions in 1764, in honour of his father Suraj Mall who had died on the battlefield. 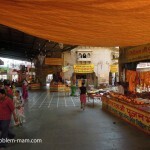 The pavilions contain three tombs and some fine wall paintings depicting the leisure pursuits of Krishna and of Suraj Mall and his wives Kishori and Hansiya.